Background/Aims: Overexpression of the G1 cyclins, D1 and E, and/or downregulation of p27Kip1 allow uncontrolled tumour cell proliferation. This study investigated the relation between these three cell cycle proteins and tumour proliferation in bladder cancer. Method: Nuclear expression of cyclin D1, cyclin E, and p27Kip1 was determined immunohistochemically in 52 primary transitional cell carcinomas, and the Ki-67 proliferation marker was also assessed. For each protein, the percentage of positive tumour cell nuclei was determined and analysed as a continuous variable. Results: Advancing tumour grade and pathological stage were accompanied by increasing proliferation indices, but decreasing p27Kip1 and cyclin D1 expression, with no significant change in cyclin E expression. Overall, cyclin D1 and E expression did not correlate with proliferation. However, in cyclin D1 overexpressing tumours (⩾ 5% nuclei positive), the level of cyclin D1 expression positively correlated with proliferation. The correlation between cyclin E expression and proliferation changed from positive to negative with increasing levels of cyclin E expression, accompanied by a coordinate increase in p27Kip1 expression. Overall, there was an inverse association between p27Kip1 expression and proliferation. However, a subset of tumours displayed high proliferation indices despite high p27Kip1 expression. The G1 cyclin index (sum of the level of expression of cyclins D1 and E) correlated positively with proliferation in superficial but not muscle invasive tumours. This correlation was stronger when the G1 cyclin index was adjusted for p27Kip1 expression. Conclusion: These findings support a role for these proteins in the proliferation, differentiation, and progression of bladder transitional cell carcinomas. In transitional cell carcinoma of the bladder (TCC), cyclin D1 overexpression correlates with low tumour grade and stage, and has been shown to be a predictor of early recurrence.17–20 Loss of p27Kip1 expression in superficial TCCs has been correlated with tumour grade and reduced survival.21 More recently, it has been reported that reduced expression of both cyclin E and p27Kip1 predicts poor survival in TCC.22 However, these three cell cycle regulators have not been studied concurrently in bladder cancer and their association with the proliferation index has not been explored. In our present study, we determined the nuclear expression of cyclin D1, cyclin E, and p27Kip1 in a series of 52 primary TCCs. The results were correlated with tumour grade and pathological stage. In addition, we studied the relation between the expression of these proteins and the proliferation index, as assessed by Ki-67 expression. We observed a paradoxical, negative correlation between the level of cyclin E expression and the proliferation index in tumours that displayed a high level of cyclin E expression (⩾ 30% nuclei positive). In contrast, the level of cyclin E expression was positively correlated with the proliferation index in low expressors of cyclin E (< 30%). We propose an explanation for these findings and discuss their implications. Formalin fixed, paraffin wax embedded tissue blocks from 52 patients with a confirmed diagnosis of primary TCC of the bladder were obtained from the department of histopathology and the human biomaterials resource centre of the Imperial College School of Medicine, Hammersmith Hospital Campus, London, UK. The median age of the patients was 71 years (range, 35–95). Forty six were men and six were women. Tumour specimens were obtained from 34 transurethral resections, six cystectomies, and 12 biopsies (transurethral resection or cold cup). In all cases, only samples in which the presence of detrusor muscle was identified histologically were selected to ensure accuracy in reflecting pT category. None of the patients had received irradiation or chemotherapy. Seven tumours were classified according to the World Health Organisation23 as well differentiated (grade 1), 26 as moderately differentiated (grade 2), and 19 as poorly differentiated (grade 3). In accordance with the classification of the American Joint Committee on Cancer,24 there were 14 pTa, 19 pT1, seven pT2, and 12 pT3/4 tumours. In 29 tumours, a papillary phenotype was identified. Well characterised, mouse monoclonal antibodies against Ki-67 antigen (MIB-1; Immunotech, Marseille, France), p27Kip1 (Transduction Laboratories, Lexington, Kentucky, USA), and cyclin E (HE12; Santa Cruz Biotechnology, Santa Cruz, California, USA), each at a 1/400 dilution, and cyclin D1 (P2D11F11; Novocastra Laboratories, Newcastle upon Tyne, UK), at a 1/20 dilution, were used. Serial sections (5 μm thick) were mounted on poly-L-lysine coated slides. Sections were dewaxed, rehydrated, and washed in phosphate buffered saline (PBS; pH 7.2). To enhance antigen exposure, slides were immersed in prewarmed 0.01M citrate buffer (pH 6.0) and microwaved at 750 W (Philips M902), three times for five minutes each. Sections were then allowed to cool for 20 minutes. Endogenous peroxidase activity was blocked with 0.3% vol/vol H2O2 for 30 minutes. Sections were washed in PBS and incubated with 10% normal rabbit serum (Dako, Glostrup, Denmark) for 30 minutes to block non-specific binding sites. This was followed by overnight incubation with each primary antibody at 4°C. Secondary antibody (biotinylated rabbit antimouse immunoglobulin; 1/200 dilution; Dako) was applied for 45 minutes at room temperature. After sections were washed in PBS, avidin–biotin–horseradish peroxidase complexes (1/100 dilution; Dako) were applied for 30 minutes. 3,3′-Diaminobenzidine solution (0.05% wt/vol; Sigma, Poole, Dorset, UK) was used as the final chromogen and sections were counterstained with Cole’s haematoxylin (Pioneer Research Chemicals, Essex, UK). Sections in which the primary antibody was replaced by PBS were used as negative controls. Sections with stromal lymphoid follicles clearly displaying an inverse relation between p27Kip1 and Ki-67 expression in lymphocytes were included as positive controls for p27Kip1 and Ki-67. In addition, stromal or peritumoural lymphocytes were present in most cases and served as internal controls for p27Kip1 and Ki-67. As previously reported by Dutta et al,25 we consistently found endothelial cytoplasmic crossreactivity with the HE12 anti-cyclin E antibody used. Whereas they had suggested that this property of the HE12 antibody could be used to assess tumour vasculature, we found it to be a consistent and useful positive internal control for cyclin E immunoreactivity. 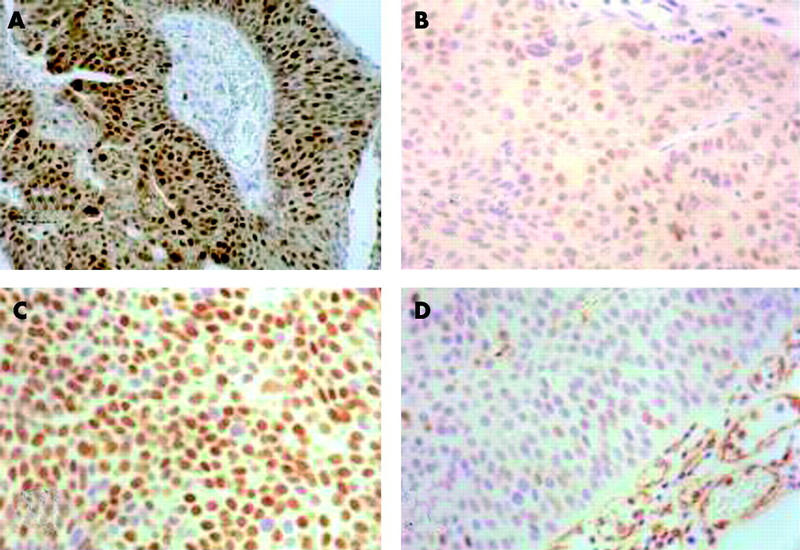 A breast tumour specimen with known cyclin D1 and E expression was used as a positive control for cyclins D1 and E.
Slides were reviewed independently by three investigators, without knowledge of the clinical data (AAK, KSC, ENL). Interobserver discrepancies were resolved using a double headed microscope. Only nuclear expression was recorded. The number of distinctly positive tumour cell nuclei was counted under high power (×400) using a 10 × 10 eyepiece grid. In total, 1000 tumour cells were assessed. The number of positive nuclei was expressed as a percentage of all tumour cell nuclei counted. For Ki-67, p27Kip1, and cyclin E, a single case for each antibody was excluded from the final analysis because of inadequate staining. Individual staining indices (percentage of nuclei positive) were analysed as continuous variables. Cut off points for high versus low expression, based on median levels of expression, were included when appropriate. The Mann-Whitney U and Kruskall-Wallis tests were used for comparing two and three different groups, respectively. Correlations between variables were assessed by Spearman’s rank correlation test (rs = correlation coefficient). Multiple logistic regression was used to assess which independent variables were most strongly associated with a dichotomised dependent variable. All p values were two tailed and considered significant when ⩽ 0.05. Statistical analyses were performed on Stata 6.0 (Stata Corporation, College Station, Texas, USA). Figures 1 and 2 show typical examples of the immunohistochemical expression of cyclin D1, cyclin E, p27Kip1, and Ki-67 in representative TCCs. The criteria for scoring were based on previous experience from our group, in addition to review of literature. Nuclear expression of cyclin D1 ranged from 0% to 82.6% of tumour cells. Less than 5%, 5–30%, and > 30% nuclear expression of cyclin D1 was seen in 31, 13, and eight of the 52 cases, respectively. Six cases had > 50% expression. 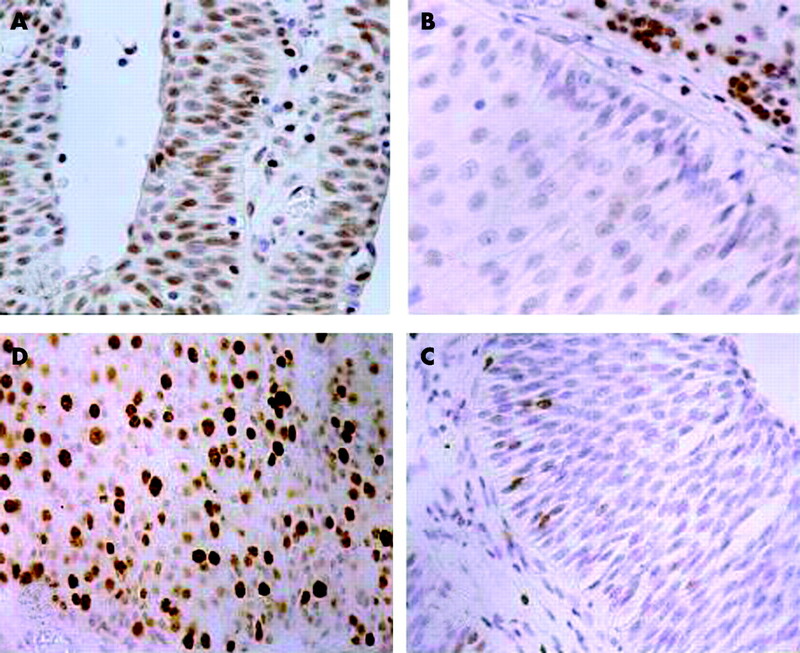 Immunohistochemical staining of representative bladder transitional cell carcinomas with mouse monoclonal antibodies against cyclin D1 and cyclin E (HE12). (A) Strong nuclear and cytoplasmic expression of cyclin D1 in a grade 2, superficial tumour (original magnification, ×200). (B) Low nuclear expression of cyclin D1 in a grade 3, muscle invasive tumour. (C) Strong nuclear expression of cyclin E in a grade 2, superficial tumour. (D) Low nuclear expression of cyclin E in a grade 2, muscle invasive tumour. Note the endothelial cytoplasmic crossreactivity with the HE12 anti-cyclin E antibody used (B–D: original magnification, ×400). Immunohistochemical staining of representative bladder transitional cell carcinomas with mouse monoclonal antibodies against p27Kip1 and Ki-67 (Mib1). (A) Strong nuclear expression of p27Kip1 in a grade 1, papillary tumour. (B) No nuclear expression of p27Kip1 in a grade 2, muscle invasive tumour, showing strong staining of stromal lymphocytes. (C) Strong nuclear expression of Ki-67 in a grade 3, muscle invasive tumour. (D) Low nuclear expression of Ki-67 in a grade 1, papillary tumour (A–D: original magnification, ×400). Cyclin E expression ranged from 0% to 78.1% in the tumour cells. Less than 5%, 5–30%, and > 30% cyclin E expression was seen in 10, 16, and 25 of 51 tumours, respectively. In 14 tumours > 50% of nuclei were positive. p27Kip1 nuclear reactivity ranged from 0% to 67.4% in the tumour cells. Less than 30%, 30–50%, and > 50% p27Kip1 expression was found in 29, nine, and 13 of 51 cases, respectively. Ki-67 protein expression ranged from 0.1% to 99.0% in the tumour cells. Less than 20%, 20–50%, and > 50% tumour cell nuclei were Ki-67 positive in 29, 17, and five of 51 cases, respectively. Low expression of p27Kip1 (< 30% nuclei positive) was seen in 29 of 51 cases, whereas cyclins D1 and E were overexpressed (⩾ 5% and ⩾ 30% nuclei positive, respectively) in 21 of 52 and 25 of 51 of all cases, respectively. Overexpression of one or both cyclins was seen in 33 of 50 tumours. Cyclins D1 and E were co-overexpressed in 11 cases. In 22 tumours, a single G1 cyclin was overexpressed: cyclin D1 in seven and cyclin E in 15. The most frequent combination was that of low cyclin D1, low cyclin E, and low p27Kip1 expression, which was seen in 12 of 50 cases. The combination closest to a normal profile—low cyclin D1 and E expression but high p27Kip1 expression—was present in only four of 50 cases. Five of 50 cases displayed overexpression of both cyclins D1 and E, in addition to downregulation of p27Kip1. The proliferation index (as determined by Ki-67 expression) increased with increasing tumour grade (p = 0.012) and pathological stage, and was significantly higher in muscle invasive (⩾ pT2) and non-papillary tumours than in their superficial and papillary counterparts (p = 0.002 and 0.03, respectively; table 1). In contrast, p27Kip1 and cyclin D1 expression decreased with increasing grade and depth of tumour invasion, and were significantly higher in superficial tumours than in muscle invasive ones (p = 0.047 and 0.008, respectively). These correlations were notably more significant for cyclin D1 than for p27Kip1. Cyclin D1 was also strongly associated with papillary morphology (p < 0.0001), whereas p27Kip1 was not (p = 0.69). Although a modest decrease in the level of expression of cyclin E was seen with increasing grade and depth of tumour invasion, these differences were not significant. There was also no association between cyclin E expression and papillary morphology (p = 0.96). We also analysed levels of cyclin D1, cyclin E, p27Kip1, and Ki-67 expression together as continuous variables using multiple logistic regression, with muscle invasion (presence versus absence) as a dichotomised outcome variable. Only proliferation index (Ki-67 expression) and cyclin D1 expression were found to be significantly associated with the presence or absence of muscle invasion in this analysis (p = 0.015 and 0.045, respectively). Overall, the level of expression of cyclins D1 and E did not correlate with the proliferation index (rs = −0.04, p = 0.8, fig 3A; and rs = 0.21, p = 0.15, fig 3C; respectively). However, when low expressors of cyclin D1 (< 5% nuclei positive, n = 31) were excluded, we saw a significant positive correlation between cyclin D1 expression and proliferation index (rs = 0.58, p = 0.008, n = 20; fig 3B). Scatter diagrams of cyclin D1 or cyclin E versus Ki-67 expression (percentage of nuclei positive). 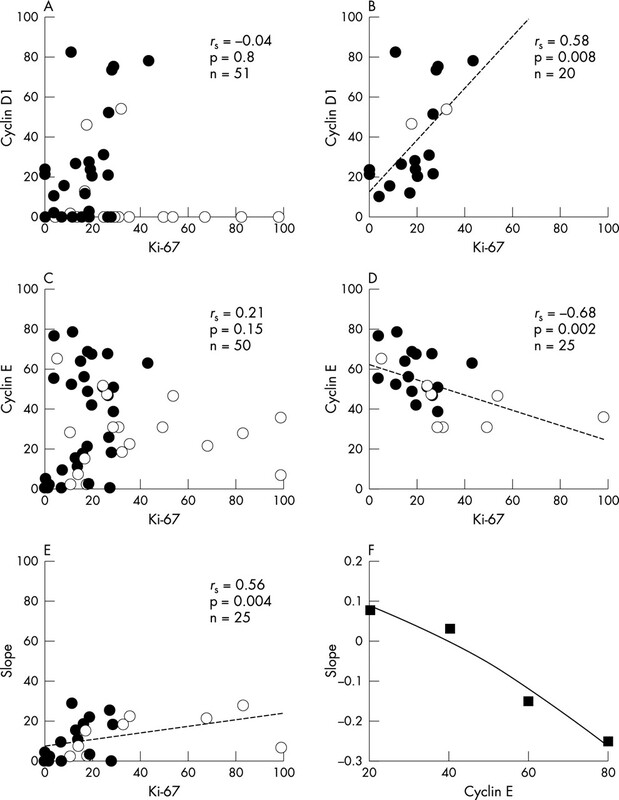 (A) All cases together, showing no correlation between cyclin D1 and Ki-67 expression; (B) high expressors of cyclin D1 (⩾ 5% nuclei positive), showing a positive correlation; (C) all cases together, showing no correlation between cyclin E and Ki-67 expression; (D) high expressors of cyclin E (⩾ 30% nuclei positive), showing a negative correlation; and (E) low expressors of cyclin E (< 30% nuclei positive), showing a positive correlation (rs, Spearman’s rank correlation coefficient). Filled and unfilled circles represent superficial and muscle invasive tumours, respectively. (F) shows the slope of the regression line for each successive 20% increase in cyclin E expression. The relation between cyclin E expression and the proliferation index changed from positive to negative at > 40% cyclin E expression. We next evaluated the relation between cyclin E expression and the proliferation index in high expressors of cyclin E (⩾ 30% nuclei positive, n = 25) versus low expressors (< 30% nuclei positive, n = 25). 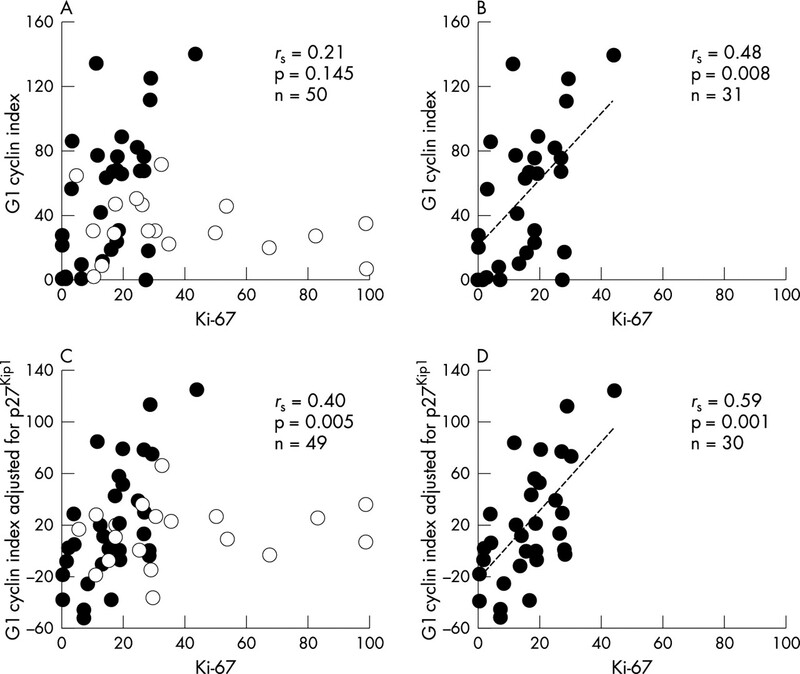 Paradoxically, high expressors of cyclin E displayed a significant negative correlation between the level of cyclin E expression and the proliferation index (rs = −0.68, p = 0.002; fig 3D). In contrast, this association was reversed in low expressors of cyclin E (rs = 0.56, p = 0.004; fig 3E). To determine the level of cyclin E expression at which this correlation changed from positive to negative, the slope of the regression line for each successive 20% increase in the level of cyclin E expression is shown (fig 3F). The switch from a positive to a negative association occurred at > 40% expression of cyclin E.
To explain these opposing relations, we examined the expression of p27Kip1, a major inhibitor of cyclin E associated kinase activity. We found that high expressors of cyclin E (⩾ 30%) compared with low expressors had significantly higher levels of p27Kip1 expression (mean, 35.0%; SEM, 4.5% versus mean, 20.6%; SEM, 4.0%; p = 0.025). Furthermore, although there was an overall positive correlation between p27Kip1 and cyclin E expression (rs = 0.32, p = 0.02; fig 4A), we observed a difference in this association between high and low expressors of cyclin E. High expressors of cyclin E displayed a positive correlation between p27Kip1 and cyclin E expression, approaching significance (rs = 0.38, p = 0.06), whereas in low expressors of cyclin E, there was no significant correlation (rs = −0.24, p = 0.24). More importantly, as shown in fig 4B, there was a pronounced increase in the slope of the regression line coincident with the > 40% level of cyclin E expression. (A) Scatter diagram of p27Kip1 versus cyclin E expression (percentage of nuclei positive), showing a weak correlation between p27Kip1 and cyclin E expression. (B) The slope of the regression line for each successive 20% increase in cyclin E expression, showing a pronounced increase in the correlation between p27Kip1 and cyclin E expression, coincident with a level of > 40% cyclin E expression. (C) Scatter diagram of p27Kip1 versus Ki-67 expression (percentage of nuclei positive), showing a weak negative correlation between p27Kip1 and Ki-67 expression (rs, Spearman’s rank correlation coefficient). Filled and unfilled circles represent superficial and muscle invasive tumours, respectively. Because cyclin D1 is known to sequester p27Kip1, thereby decreasing the pool of p27Kip1 available for inhibition of cyclin E–CDK2 activity, it was also important to determine the level of expression of cyclin D1. However, we did not find a significant difference in its level of expression in high versus low expressors of cyclin E (mean, 18.4%; SEM, 5.6% versus mean, 11.5%; SEM, 3.4%, respectively; p = 0.599). An overall inverse correlation between p27Kip1 expression and proliferation index was found (rs = −0.36, p = 0.01; fig 4C). However, eight tumours displayed high proliferation indices (⩾ 20%), despite high level expression of p27Kip1 (⩾ 30%). Each of these showed overexpression of one or both cyclins (D1 and/or E). Four of these were poorly differentiated and muscle invasive tumours. When superficial TCCs were compared with muscle invasive tumours, we found weak positive correlations between the proliferation index and expression levels of both cyclins D1 and E in superficial but not in muscle invasive tumours (rs = 0.37, p = 0.04 and rs = 0.33, p = 0.07 versus rs = −0.29, p = 0.22 and rs = 0.04, p = 0.87, respectively). Although there was no significant correlation between the level of p27Kip1 expression and the proliferation index among superficial tumours (rs = −0.29, p = 0.108), a corresponding negative correlation was seen in the muscle invasive group (rs = −0.45, p = 0.05). To assess whether there were any cooperative effects of the expression of both G1 cyclins on tumour proliferation, we determined the sum of their levels of expression as a combined index of G1 cyclin expression. Although overall this index did not correlate with the proliferation index (rs = 0.21, p = 0.145, n = 50; fig 5A), there was a significant positive correlation between the proliferation index and the combined levels of expression of cyclins D1 and E in superficial TCCs but not in muscle invasive tumours (rs = 0.48, p = 0.008 versus rs = −0.15, p = 0.534; fig 5B). To account for the inhibitory effect of p27Kip1 on G1 cyclin activity, we simply subtracted the level of p27Kip1 expression from the G1 cyclin index for each tumour, yielding a composite expression index of all three cell cycle proteins. This index was significantly correlated with the proliferation index for all TCCs together (rs = 0.40, p = 0.005, n = 49; fig 5C), and even more strongly so in the superficial group of TCCs (rs = 0.59, p = 0.001, n = 30; fig 5D), but not in muscle invasive tumours (rs = 0.23, p = 0.324). Scatter diagrams of the G1 cyclin index (sum of the levels of expression of cyclins D1 and E) versus Ki-67 expression (percentage of nuclei positive). (A) All cases together, showing no correlation between G1 cyclin index and Ki-67 proliferation index. (B) Superficial tumours only, showing a positive association. (C) All cases together, with the G1 cyclin index adjusted for p27Kip1 expression (level of p27Kip1 expression subtracted from G1 cyclin index), showing a positive correlation. (D) Superficial tumours only, showing an even stronger positive correlation (rs, Spearman’s rank correlation coefficient). Filled and unfilled circles represent superficial and muscle invasive tumours, respectively. There was no correlation between p27Kip1 and cyclin D1 expression (rs = 0.02, p = 0.90), or between cyclin D1 and E expression (rs = 0.14, p = 0.35). When levels of cyclin D1, cyclin E, and p27Kip1 expression were analysed together as continuous variables using multiple logistic regression, with the proliferation index included as a dichotomised dependent variable (high versus low, at a 20% cut off), we found that only p27Kip1 expression was significantly associated with the proliferation index (p = 0.045). In our immunohistochemical study, we determined the nuclear expression of three key regulators of the G1–S transition, cyclin D1, cyclin E, and p27Kip1, in primary TCC. The expression of these cell cycle proteins was correlated with grade, pathological stage, and the proliferation index. The inclusion of biopsied samples limited accurate classification of the pathological stage, but there was adequate tissue in all cases to classify tumour grade. The expression of cyclin D1, cyclin E, and p27Kip1 in our study was comparable to that reported previously, including the results from studies on animal models of TCC.17–22,27,28 Advancing tumour grade and depth of invasion were accompanied by increasing proliferation indices but decreasing cyclin D1 and p27Kip1 expression, whereas cyclin E expression did not change significantly, but there are conflicting reports of cyclin D1 expression in TCC. Three studies found an association between cyclin D1 overexpression and low tumour grade and/or stage,17,18,20 but others have reported no relation in TCC.19 These differences may result from the different antibodies, methods, and/or cut off points used. Unlike previous reports, we decided to analyse levels of cyclin D1 expression as a continuous variable. We also found a strong association between cyclin D1 expression and papillary phenotype, as reported by others.17,20 Our results suggest that cyclin D1 overexpression may be an important early event in the progression of TCCs. In addition, its association with well differentiated, papillary tumours suggests that cyclin D1 may also play a role in tumour differentiation. However, it is not clear whether the apparent downregulation of cyclin D1 with increasing tumour grade and stage occurs in the same TCC cells, or is the result of a clonal selection process, whereby the accumulation of other mutations (for example, RB and TP53)29 possibly confers a greater growth advantage to cyclin D1 negative cells. The role of cyclin D1 as a positive regulator of cell cycle progression is dependent on the presence of wild-type pRb.6–8 Moreover, pRb can directly induce cyclin D1 gene expression by interacting with the D1 promoter.30 Cyclin D1 overexpression and inactivating RB mutations have not been found concurrently in tumour cells,8,31–33 and are considered mutually exclusive events in TCC.18 It is likely that the apparent downregulation of cyclin D1 is a manifestation of the clonal selection hypothesis outlined above, as opposed to a decrease in cyclin D1 expression per se. Further studies are needed to verify this hypothesis in bladder cancer, although our data are consistent with the hypothesis that a cyclin D1 dependent pathway determines the evolution of a group of well differentiated low-stage papillary TCCs, whereas tumours that evolve via cyclin D1 independent mechanisms are less differentiated and pathologically more aggressive. p27Kip1 is a major negative regulator of cyclin E and can render it functionally inactive.1–3 High expressors versus low expressors of cyclin E had significantly higher levels of p27Kip1 expression, and overall there was a positive correlation between p27Kip1 and cyclin E expression.23,41 Cyclin D1 can effectively sequester p27Kip1 away from cyclin E–CDK2 complexes,3,42 so that changes in the level of cyclin D1 can result in altered cyclin E associated kinase activity, without a corresponding change in p27Kip1 concentrations. There was no significant difference in the levels of cyclin D1 expression in high versus low expressors of cyclin E. As cyclin E expression reached high levels (> 40%), its association with the proliferation index changed from positive to negative, and this was accompanied by an increase in p27Kip1 expression, with no significant change in cyclin D1. Taken together, these findings suggest that the inverse relation between cyclin E and the proliferation index in high expressors of cyclin E might be explained, at least in part, by a coordinate increase in p27Kip1 mediated inhibition of cyclin E activity. Our study supports the experimental data of Sgambato et al.43 They demonstrated that ectopic overexpression of cyclin E in the HC11 mouse mammary epithelial cell line resulted in a prolonged G1 phase and a protracted G0–S transition, leading to growth inhibition. This was accompanied by increased p27Kip1 and decreased cyclin E associated kinase activity. They suggested a putative positive feedback loop between cyclin E and p27Kip1. Del Pizzo and colleagues22 reported that in primary bladder TCC, ⩾ 30% expression of cyclin E was associated with prolonged survival, whereas < 30% expression was associated with reduced survival. Our data suggest that the reported prognostic significance of cyclin E may be the result of its functional inactivation by the increasing amounts of p27Kip1 seen in high expressors of cyclin E. In contrast, cyclin E is probably functionally active in low expressors, as demonstrated by a positive correlation between its level of expression and the proliferation index. The relation between p27Kip1 expression and the proliferation index has not previously been studied in TCC. In normal cells, there is an inverse relation between p27Kip1 expression and the proliferation index.44,45 However, in tumour cells this association is not always present. In breast46 and colorectal cancers,47 p27Kip1 expression does not correlate with the proliferation index, whereas in some other tumours, an inverse association has been reported45,48,49 We found a weak but significant inverse relation between p27Kip1 expression and proliferation index in primary bladder cancer. Moreover, similar to previous reports in some cancers,41,44,47 we identified a subset of TCCs with high proliferation indices despite high level expression of p27Kip1. High concentrations of p27Kip1 are normally characteristic of quiescent cells, so it is not clear how these rapidly proliferating tumours tolerate this. Concurrent expression of cyclins D1 and E and the CDKI, p27Kip1, has not previously been reported in TCC. We have elucidated important interrelations between the expression of these proteins and the proliferation index that support a role for them in tumour proliferation, differentiation, and progression. Our results (1) indicate that cyclins D1 and E may cooperate in driving proliferation in the early stages of tumour progression; (2) suggest that cyclin E may be important in bladder cancer progression, despite the lack of a significant correlation between its level of expression and tumour grade or pathological stage; and (3) underscore the importance of studying cell cycle proteins concurrently rather than independently. These findings have implications for the development of novel therapeutic strategies targeting G1 phase cell cycle proteins in TCC. Cordon-Cardo C. Mutations of cell cycle regulators. Biological and clinical implications for human neoplasia. Am J Pathol1995;147:545–60. Calbo J, Parreno M, Sotillo E, et al. G1 cyclin/cyclin-dependent kinase-coordinated phosphorylation of endogenous pocket proteins differentially regulates their interactions with E2F4 and E2F1 and gene expression. J Biol Chem 2002;277:50263–74. Resnitzky D, Gossen M, Bujard H, et al. Acceleration of the G1/S phase transition by expression of cyclins D1 and E with an inducible system. Mol Cell Biol 1994;14:1669–79. Ohtsubo M, Theodoras AM, Schumacher J, et al. Human cyclin E, a nuclear protein essential for the G1-to-S phase transition. Mol Cell Biol 1995;15:2612–24. Resnitzky D, Reed SI. Different roles for cyclins D1 and E in regulation of the G1-to-S transition. Mol Cell Biol1995;15:3463–9. Lukas J, Bartkova J, Rohde M, et al. Cyclin D1 is dispensable for G1 control in retinoblastoma gene-deficient cells independently of cdk4 activity. Mol Cell Biol 1995;15:2600–11. Tam SW, Theodoras AM, Shay JW, et al. Differential expression and regulation of cyclin D1 protein in normal and tumor human cells: association with Cdk4 is required for cyclin D1 function in G1 progression. Oncogene 1994;9:2663–74. Lukas J, Herzinger T, Hansen K, et al. Cyclin E-induced S phase without activation of the pRb/E2F pathway. Genes Dev 1997;11:1479–92. Donnellan R, Chetty R. Cyclin D1 and human neoplasia. Mol Pathol1998;51:1–7. Donnellan R, Chetty R. Cyclin E in human cancers. FASEB J1999;13:773–80. Kato JY, Matsuoka M, Polyak K, et al. Cyclic AMP-induced G1 phase arrest mediated by an inhibitor (p27Kip1) of cyclin-dependent kinase 4 activation. Cell 1994;79:487–96. Toyoshima H, Hunter T. p27, a novel inhibitor of G1 cyclin–Cdk protein kinase activity, is related to p21. Cell1994;78:67–74. Rivard N, L’Allemain G, Bartek J, et al. Abrogation of p27Kip1 by cDNA antisense suppresses quiescence (G0 state) in fibroblasts. J Biol Chem 1996;271:18337–41. Lee CC, Yamamoto S, Morimura K, et al. Significance of cyclin D1 overexpression in transitional cell carcinomas of the urinary bladder and its correlation with histopathologic features. Cancer 1997;79:780–9. Niehans GA, Kratzke RA, Froberg MK, et al. G1 checkpoint protein and p53 abnormalities occur in most invasive transitional cell carcinomas of the urinary bladder. Br J Cancer 1999;80:1175–84. Shin KY, Kong G, Kim WS, et al. Overexpression of cyclin D1 correlates with early recurrence in superficial bladder cancers. Br J Cancer 1997;75:1788–92. Wagner U, Suess K, Luginbuhl T, et al. Cyclin D1 overexpression lacks prognostic significance in superficial urinary bladder cancer. J Pathol 1999;188:44–50. Del Pizzo JJ, Borkowski A, Jacobs SC, et al. Loss of cell cycle regulators p27(Kip1) and cyclin E in transitional cell carcinoma of the bladder correlates with tumor grade and patient survival. Am J Pathol 1999;155:1129–36. Mostofi FK, Sobin HL, Torlini H. Typing of urinary bladder tumours Geneva: World Health Organisation, 1973. Fleming ID, Cooper JS, Henson DE, et al, eds.American Joint Committee on Cancer (AJCC) cancer staging manual, 5th ed. Philadelphia: Lippincott-Raven Publishers, 1997:241–3. Dutta A, Chandra R, Leiter LM, et al. Cyclins as markers of tumor proliferation: immunocytochemical studies in breast cancer. Proc Natl Acad Sci U S A 1995;92:5386–90. Keyomarsi K, Pardee AB. Redundant cyclin overexpression and gene amplification in breast cancer cells. Proc Natl Acad Sci U S A1993;90:1112–16. Lee CC, Yamamoto S, Wanibuchi H, et al. Cyclin D1 overexpression in rat two-stage bladder carcinogenesis and its relationship with oncogenes, tumor suppressor genes, and cell proliferation. Cancer Res 1997;57:4765–76. Ogawa K, Kimoto N, Asamoto M, et al. Aberrant expression of p27(Kip1) is associated with malignant transformation of the rat urinary bladder epithelium. Carcinogenesis 2000;21:117–21. Cordon-Cardo C, Zhang ZF, Dalbagni G, et al. Cooperative effects of p53 and pRB alterations in primary superficial bladder tumors. Cancer Res 1997;57:1217–21. Muller H, Lukas J, Schneider A, et al. Cyclin D1 expression is regulated by the retinoblastoma protein. Proc Natl Acad Sci U S A 1994;91:2945–9. Jiang W, Zhang YJ, Kahn SM, et al. Altered expression of the cyclin D1 and retinoblastoma genes in human esophageal cancer. Proc Natl Acad Sci U S A 1993;90:9026–30. Nielsen NH, Emdin SO, Cajander J, et al. Deregulation of cyclin E and D1 in breast cancer is associated with inactivation of the retinoblastoma protein. Oncogene 1997;14:295–304. Schauer IE, Siriwardana S, Langan TA, et al. Cyclin D1 overexpression vs. retinoblastoma inactivation: implications for growth control evasion in non-small cell and small cell lung cancer Proc Natl Acad Sci U S A 1994;91:7827–31. Cote RJ, Dunn MD, Chatterjee SJ, et al. Elevated and absent pRb expression is associated with bladder cancer progression and has cooperative effects with p53. Cancer Res 1998;58:1090–4. Logothetis CJ, Xu HJ, Ro JY, et al. Altered expression of retinoblastoma protein and known prognostic variables in locally advanced bladder cancer. J Natl Cancer Inst 1992;84:1256–61. Wright C, Thomas D, Mellon K, et al. Expression of retinoblastoma gene product and p53 protein in bladder carcinoma: correlation with Ki67 index. Br J Urol 1995;75:173–9. Ito Y, Matsuura N, Sakon M, et al. Expression and prognostic roles of the G1–S modulators in hepatocellular carcinoma: p27 independently predicts the recurrence. Hepatology 1999;30:90–9. Kourea HP, Cordon-Cardo C, Dudas M, et al. Expression of p27(kip) and other cell cycle regulators in malignant peripheral nerve sheath tumors and neurofibromas: the emerging role of p27(kip) in malignant transformation of neurofibromas. Am J Pathol 1999;155:1885–91. Molendini L, Benassi MS, Magagnoli G, et al. Prognostic significance of cyclin expression in human osteosarcoma. Int J Oncol 1998;12:1007–11. Yasui W, Kuniyasu H, Yokozaki H, et al. Expression of cyclin E in colorectal adenomas and adenocarcinomas: correlation with expression of Ki-67 antigen and p53 protein. Virchows Arch 1996;429:13–9. Kamai T, Takagi K, Asami H, et al. Decreasing p27 (Kip1) and cyclin E protein levels are associated with progression from superficial into invasive bladder cancer. Br J Cancer 2001;84:1242–51. Sgambato A, Zhang YJ, Arber N, et al. Deregulated expression of p27(Kip1) in human breast cancers. Clin Cancer Res 1997;3:1879–87. Reynisdottir I, Polyak K, Iavarone A, et al. Kip/Cip and Ink4 Cdk inhibitors cooperate to induce cell cycle arrest in response to TGF-beta. Genes Dev 1995;9:1831–45. Sgambato A, Han EK, Zhou P, et al. Overexpression of cyclin E in the HC11 mouse mammary epithelial cell line is associated with growth inhibition and increased expression of p27(Kip1). Cancer Res 1996;56:1389–99. Fredersdorf S, Burns J, Milne AM, et al. High level expression of p27(kip1) and cyclin D1 in some human breast cancer cells: inverse correlation between the expression of p27(kip1) and degree of malignancy in human breast and colorectal cancers. Proc Natl Acad Sci U S A 1997;94:6380–5. Lloyd RV, Jin L, Qian X, et al. Aberrant p27kip1 expression in endocrine and other tumors. Am J Pathol 1997;150:401–7. Loda M, Cukor B, Tam SW, et al. Increased proteasome-dependent degradation of the cyclin-dependent kinase inhibitor p27 in aggressive colorectal carcinomas. Nat Med 1997;3:231–4. Jordan RC, Bradley G, Slingerland J. Reduced levels of the cell-cycle inhibitor p27Kip1 in epithelial dysplasia and carcinoma of the oral cavity. Am J Pathol1998;152:585–90. Sanchez-Beato M, Saez AI, Martinez-Montero JC, et al. Cyclin-dependent kinase inhibitor p27KIP1 in lymphoid tissue: p27KIP1 expression is inversely proportional to the proliferative index. Am J Pathol 1997;151:151–60.